It’s clear that we’re already living in a mobile-first world. 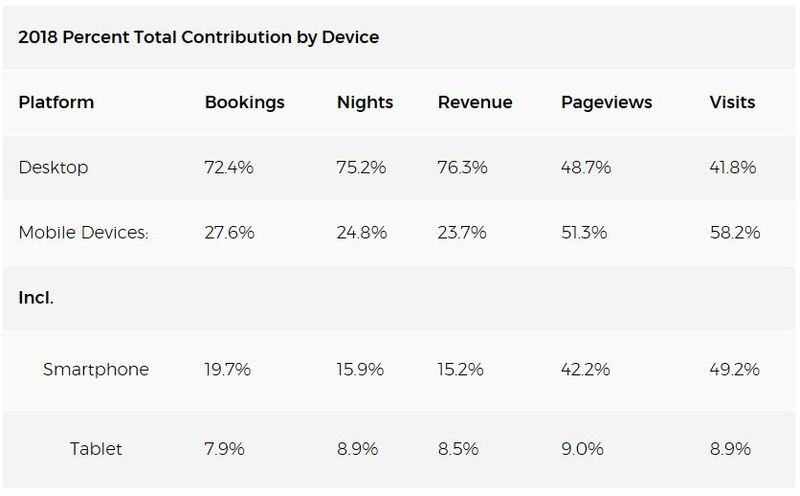 Mobile devices dominate the travel planning journey: up to half of all desktop bookings worldwide are preceded by a click on a mobile device, and 94% of leisure travelers use multiple devices (mobile, tablet, desktop) when planning and booking travel (Criteo). As we continue to experience this shift to mobile and increased complexity in the travel planning process, hoteliers need to find ways to engage their best potential guests across multiple touch points and across all devices, especially mobile. Today’s typical online travel consumer is exposed to more than 38,983 micro-moments in any 60-day timeframe. They also visit an average of 18 websites via multiple devices in eight sessions before making a hotel booking (Google Research). This journey results in some serious competition for the travel consumer’s attention and has become increasingly dominated by mobile micro-moments and touch points. Hoteliers need to keep the property website, which is the foundation of their digital marketing and distribution strategy, up to the mobile-first standards demanded by today’s travel consumer. With nearly 59% of website visitors now viewing on mobile devices, a fully responsive mobile-first website design is a must. If your property website is older than two years, it’s due for a redesign. Websites older than two years are often lacking the latest best practices in technology, design, and UX, such as a mobile-first design, content merchandising, Google AMP (Accelerated Mobile Pages), schema, and technical SEO considerations. An outdated website leads to lower conversions. The website download speeds across various devices also inevitably affects conversion rates on the hotel website: fast download speeds drastically improve the user experience and increase the user’s desire to purchase on the site. According to Google, 53% of visits are abandoned if a mobile site takes longer than three seconds to load. Mobile-first responsive websites with cloud hosting and CDN (Content Delivery Network) provide far better server response times and faster download speeds across geographies. Automated schema markup on the hotel website. Schema markup helps search engines understand the content and intent of websites, especially dynamic content elements such as events and happenings pages, special offers, opening hours, and star ratings. These rich snippets make hotel webpages appear more prominently in SERPs, thus improving visibility of a hotel website’s overall SEO performance. One of the important benefits is the Featured Snippets, which Google creates dynamically based on the content of your website and places on top of the search results. Google Accelerated Mobile Pages (AMP) pages which download fast on mobile and wearable devices and are featured as news and info “teasers” in the Google AMP teaser section in mobile SERPs. This works to increase hotel visibility and create another entry point to boost mobile visitors and bookings, as well as provide another opportunity to outshine the competition. Reserve 15-25% of your property’s digital marketing budget for multichannel campaigns.